pure coat Gloss Sealer is a clear solvent based sealer that enhances and protects the appearance of all surfaces with a wet-look gloss finish. 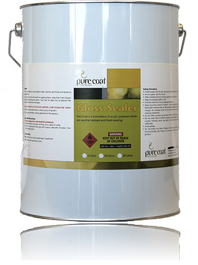 The pure coat Gloss Sealer forms a transparent water repellent barrier, reducing moisture and penetrating the material, inhibiting the growth of fungi and weeds. This protective coating is hard-wearing in high traffic areas and is perfect for home entertaining areas, driveways or workshop floors. Broom-in a chemical mix (generally acid etching)to affected areas, particularly stained, dirty or moss covered surfaces. To achieve a non slip surface, apply pure coat Highly Slip Resistant Sealer. Avoid use near naked flames or other sources of ignition. Ensure good ventilation during application of the product.